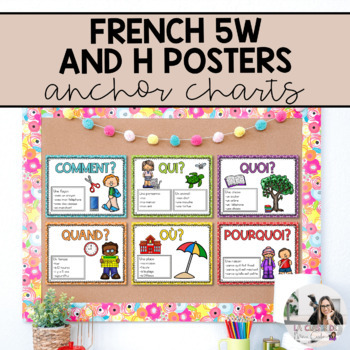 Here is the full set of anchor charts for use in a French classroom. It helps the students learn (without using English translations) what the 5 Ws and H are in French, how to use them, when to use them and it gives them examples so they understand the type of answer one may be looking for when using that question word. 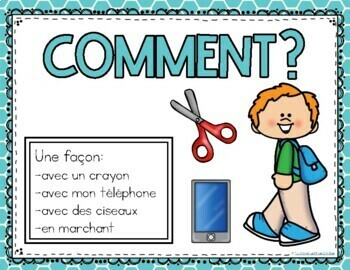 This is a great resource to use to help teach your students how to ask questions in French! → Please go to your My Purchases page (you may need to login). Beside each purchase you'll see a Provide Feedback button. Simply click it and you will be taken to a page where you can give a quick rating and leave a short comment for the product. Each time you give feedback, TPT gives you feedback credits that you use to lower the cost of your future purchases. I value your feedback greatly as it helps me determine which products are most valuable for your classroom so I can create more for you. It took a lot of time and effort to make this anchor chart, this is intended for personal classroom use. Please do not use commercially or repost on TPT or any other website. Limit one person per purchase unless you are buying multiple licenses.